I first saw The Life and Times of Rosie the Riveter in the early 1980s. Much like The Atomic Café (Kevin Rafferty, Jane Loader, Pierce Rafferty, prods/dirs. ), which was released about the same time, it made extensive use of rarely seen government propaganda films, but reinterpreted them in a post-modern context—perhaps as an agitprop response to the early days of the Reagan Administration. However, the principle difference between the two films was in director Connie Field's choice of women's voices to guide that reinterpretation. As in her subsequent work, Freedom on My Mind, Field uses oral history to share with us the moments in the lives of her subjects when they realized that they had the power to see their personal struggles fulfilled in service to a greater cause— to witness the spark that ignites one to action. 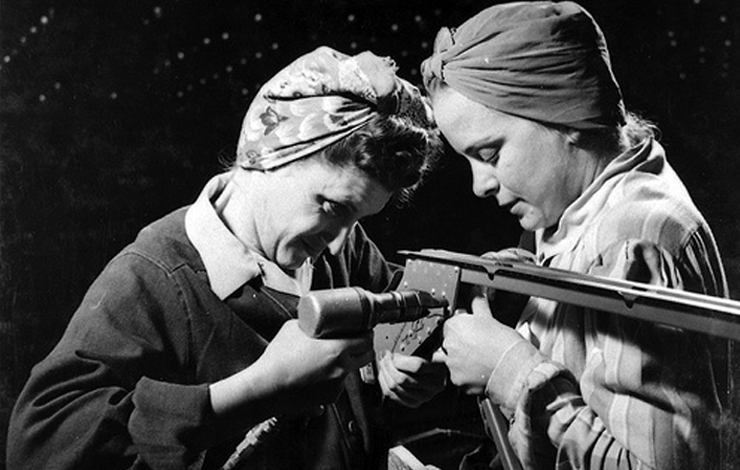 That "spark" came from the tip of a welding torch, wielded skillfully by a bevy of women who heeded the call to work during the Second World War. Field contrasts the US Government's propaganda films—one features a glamorous 1940s pin-up model exhorting women to duty with lines like "Do you have to have a reason? We're in a jam, aren't we?" as she snaps her visor shut—with the real story of the women who went to war on the homefront. Often forced into work for economic reasons, they faced—and overcame—workplace dangers as well as racial and gender discrimination. Lyn Childs, for example, recalls seeing a young, white male officer mistreating one of her Filipino co-workers. Childs turned up the flame on her welding torch and told the officer, "If you go one more foot I'll cut your guts out." Ordered to the commander's office, she climbed the steps with trepidation, but then turned to see all her co-workers lined up behind her, voicing support. At that moment, she knew the power of standing up for her convictions, and the strength that comes from inspiring the support of others. These stories of burgeoning activism are more valuable now then ever, as our media drowns viewers in a sea of bad news and trivia. Fields' work in oral history has influenced my own work, which includes recent profiles of political activists in Texas. If it's true (as Gandhi said) that we can only hope to transform society by transforming ourselves, then being able to access these courageous stories provides powerful role models for social change. After World War II, the government made new (and equally hilarious) propaganda films to convince the "Rosies" to go back to being "housewives and mothers," and the women in Field's film comment on the conflicts within their own families as they wrestled with both their newfound independence and the postwar American dream of suburban domesticity. As Lola Weixel sighs, "All I really wanted was to one day make a very beautiful ornamental gate....Was that so much to want?" But she also concludes, "We were really a smart-looking group of ladies, and we all loved one another, and I hope for that feeling in this country again, but not for a war." Indeed, Lola; more now than ever. The Life and Times of Rosie the Riveter is available through Clarity Films and Direct Cinema Ltd.
David Weisman is currently directing the video portion of an online oral history project for the Conservation History Association of Texas, www.texaslegacy.org. He lives in Morro Bay, California, and works as a media activist. He can be reached at davidweisman@charter.net.